Little Nell, I did both this year. Unfortunately it was really hot and I fell to bits in Boston despite training really well. London came around too soon and I still couldn't walk properly on the way out to the start line, but I got round better than I had expected to (still got a GFA time at London!). Lots of people do both, but you need to ramp up your training to be fit for 2 marathons in quick succession and you need to accept that the second one will be hard going and your time is likely to be slower than usual. Having said that, Boston is a real experience and I would love to return someday. If you have the option, I would suggest you go for it. Excellent - many thanks, rodeoflip... that's helpful. I can't believe you couldn't walk properly in London yet still ran a GFA - amazing! I did the double in 2014 - london first - ran GFA and then flew out to Boston - felt ok at the start (year after the bombing so we where searched loads of times before even starting so it was a long but understandable morning) - set off but very quickly that early downhill section blew my poor quads - quickly had to accept it was not going to be a PB attempt and just enjoyed the ride - coming round into the finish is still the highlight of my 26 marathons, what an emotional place it was that year. Go for it, do the double and just enjoy the ride! Having the amazing luck of getting a ballot place for the 2017 VLM, I sadly had to defer due to personal reasons. I've paid my fees and have my spot for 2018 and started running again in June. This will be my first Marathon of any kind and have only once run a half before. I'm currently running 3 times a week. Two four miles and then a longer run, this week I hit 9 miles. I plan to keep this up, slowly increasing my long runs until December. Then I plan to start following an Intermediate Marathon plan. Does this sound sensible? Does anyone have any advice on anything else I should be doing, useful gear I should get? I plan on taking it seriously and doing the hard work. You are doing fine as your training plan as long as you mix it with additional types of running - e.g. speed, fartlek, hills, paced as well as the LSR. If you have a finishing time in mind then others can help you with more focused advice. I also offer route familiarisation runs after October but these only work for those living close to London. For the moment I have being doing tempo, distance running. I plan to add other types in once my 'proper' training kicks in, in December; Unless you think I would be better starting sooner? Originally I thought I would just be happy to get around, running all the way if possible. The more i train the more i think a 4:30 - 5:00 finish would be realistic and I would be really happy with. Unfortunately I live in Devon otherwise I would jump at the chance of running with you. I have been running with friends, but they don't exceed 10k, which is only really going to be useful for my shorter runs. I had considered joining a club but my local one has a reputation for being very elitist. I will be one of the Blue Start (ballot) 5 hour pacers next April. I believe I posted a 24 week training schedule earlier. With 34 weeks to go, you could try doing weeks 13 to 23 twice if you start now. My course training runs include a 14 mile run (from Tower Bridge to Finish line) in January and a 20 mile run (from Cutty Sark to finish line) in February and possibly repeated in March. Come over as if it was a scheduled race. I run at a leisurely pace as I natter all the way. I started running in November 2016 to lose weight, and then found that it helped me manage my anxiety and depression. 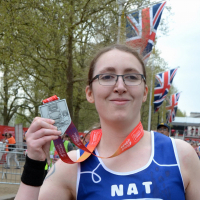 I started to push myself and then decided that I wanted to run a marathon (the dream was London) and that my first marathon I would fundraise for Mind / Samaritans. Luckily, I was granted a charity place with Mind - but now the real work starts... not only training but also fundraising. I have my first Half Marathon in Birmingham in October which I'm unprepared for. I'm not setting a time for my first marathon, I just want to get around and enjoy the day. So far, fundraising is not going as well as I'd hoped, which is frustrating as a lot of people know my story and my struggles and promote mental health charities on social media, but have yet to sponsor me or provide support. Do you guys have any fundraising tips? I've never done anything like this before, and the marathon alone is a massive challenge - I was literally an overweight couch potato before I started running, so the idea of even walking a marathon would have been a no no. Hi akaSovereign. First of all congratulations taking the leap and deciding to run your first marathon! Secondly, try not to get stressed about the fundraising - I know that's easier said than done when you experience anxiety, as you're likely to worry about it. With regard to sponsorship I imagine a lot of people wait until nearer the time, so you'll most likely see more support in March/April time. In the meantime perhaps break the goal down into achievable chunks, and arrange some fundraising events. Again, this can be challenging as it might take you out of your comfort zone, but try to embrace it as part of your challenge, and another step along your recovery journey. > Hi akaSovereign. First of all congratulations taking the leap and deciding to run your first marathon! Secondly, try not to get stressed about the fundraising - I know that's easier said than done when you experience anxiety, as you're likely to worry about it. With regard to sponsorship I imagine a lot of people wait until nearer the time, so you'll most likely see more support in March/April time. In the meantime perhaps break the goal down into achievable chunks, and arrange some fundraising events. Again, this can be challenging as it might take you out of your comfort zone, but try to embrace it as part of your challenge, and another step along your recovery journey. With the car boot sale did you sell everything? If not you could always try another one later in the year - different stuff sells better at different times of year. You could also ask people to donate things to sell. This may be easier for people than giving money, and it helps them out getting rid of stuff the don't need/want any more. Im also sponsoring myself £1 for every training run and pay in at the end of each month. Which I think can help as people can see you're donating as well as asking for sponsorship. Lastly have you heard of Easy Fundraising? It's basically a cash back shopping site but raises money for good causes. You can set one up for Mind in your name and direct friends and family to shop via there. It's not a lot but it all adds up! Great news. I will be one of the 5 hour pacers again at VLM 2018. Let me know if you want my opinion on VLM. Hey guys. Apologies for my absence after setting this group up wayyy back in April, I've been away for personal reasons not laziness I promise Harmander you've done a great job of keeping this thread going through the quiet months until people start to hear back about ballot places. Only thing now is *if* the unthinkable happens and I get a ballot place for London '18, would I take it? I cant really afford another trip to UK - but if its a choice between an autumnal Canberra marathon (3000 people) or springtime in London (40,000 people), I know which one I'd rather be doing! For the record running is going *really* well at the moment with 2017 having seen PB's at 3km, 5km, 10km, 21.1km and 42.2km! and I'm chomping at the bit in anticipation for Melbourne Marathon in a little over 2 weeks time. If improvements keep coming i wont *need* a ballot place for London to run it again in future - I'm getting closer and closer to what I previously thought was unthinkable: GFA times! I shouldn't really jinx things - but I'm hoping that I can take a few more minutes off the PB and possibly score a BQ! That would mean it'd be almost exactly 4 years for "Couch2BQ" (and around 10,000km run in that time). Last year, there was a sneaky way of seeing of you had a ballot place, before the mags came out. It was something to do with checking emails from VLM and seeing what email lists were included in your email (something like that, anyway). It seemed to work - well, it worked for me and a few others on here. Does anyone know if there is anything like that this year? Barneschar - It is a pleasure to keep others spirits up. Dave Woods - yes I believe I will be a Blue Start 5:00 hour pacer again (4:58 actually). For all others and particularly first timers I will shortly be posting th dates of VLM course familiarisation runs of approximately 7 miles n November (Blue Start to Cutty Sark), 14 miles (Tower Bridge to Finish line plus a bit to MacDonalds on Whitehall) in December and and again in January with the 20 miler (Cutty Sark to Finish line) in March. Will be running (and talking) at 12 minute/mile pace each time with the proviso that I get fed a Big Mac Meal as a reward by each of the group that joins me (I accept IOUs) - or a small contribution to a charity of my choice if you think I should not be eating a Big Mac. For those waiting to start their training, I suggest that you start asap. I have posted a training plan on this forum in the past but feel free to folow a commercial one if you wish - just don't mix the two. Hi Harmander, thank you very much for this. I won’t be able to join the training runs as I live overseas, but I appreciate the offer. Please would you be able to repost your training plan, or even PM me a copy? I’ve searched but I can’t find it in the forums. Thank you! This is the short version of the sub 5 hour 24 week training plan - there are classic and a Get You Around (GYA) versions too. I have post it in two parts as there is a limit on size of a post. RUN IS FASTER THAN 11 MINUTES A MILE - AS CLOSE TO 10 MINUTES A MILE FOR RUNS UNDER 2 HOURS. > Hey guys. Apologies for my absence after setting this group up wayyy back in April, I've been away for personal reasons not laziness I promise :) Harmander you've done a great job of keeping this thread going through the quiet months until people start to hear back about ballot places. > Sorry, super long post. Thanks :) it just seems like everyone else that is fundraising in a Running group that I am a part of on Facebook gets a lot more support, especially from businesses giving free items for them to raffle off or being able to bag pack in supermarkets, whereas I just seem to be getting a wall of "sorry, we can't help". I've asked 5 different supermarket chains about bag packing for a day, but all have said no. I've promoted my page on Facebook and Twitter, and had likes, retweets, shares, etc but no donations; I know a lot of people have said they will sponsor me closer to the time, but still. I've stopped sharing it for a bit now in the hope that I can get a ballot place to take the pressure off and then go about fundraising a bit more freely and without the weight on my shoulders. My training for the last 2 weeks has been pretty bad :/ not going to be a good week this week either as I'm ill. My first Half Marathon is on the 15th, so getting nervous now, then REALLY need to get a plan in place for the marathon, adding some cross training because I have Runner's Knee due to a muscle imbalance. Now that entries are beginning to drop, I'm a bit gutted that I decided to wait until 2019 to go for my GFA entry... here's hoping the qualifying time remains the same for then. Well done to everyone who got an entry this time around! Happy training! Oh well - never mind eh? I can re-focus my efforts on perhaps a tilt at NYC 2018, Tokyo 2019 and Boston 2020 to complete the big 6! Reality has kicked in for me... I received my GFA acceptance form and mag on Monday morning and I've used my Manchester time to enter Boston as well. So, if all goes to plan, 2018 should bring two marathons within six days of each other... eeek!!! rodeoflip - what was the key to your training for Boston and London? I know you asked Rodeoflip - but when I did the same I simply relied on a bit of running practice in between - perhaps not the best ever answer to a question I was not asked but I just couldn't resist. Little Nell - as Harmander says - simply do a little practice in between to keep the legs turning over. Train for the first race and then rely on that for the second. I did the other way round - London then Boston - and very quickly into Boston i knew PB wasnt on so enjoyed it - ran 3:06 then 3:20 - enjoy Boston, that finish is so emotional. Thanks for your replies, Harmander and andyc209, much appreciated - all wise words are gratefully received. I'm fairly happy about the intervening days... I was more thinking about the key training sessions: strength training, increased volume, hill sessions... all of the above? (I suspect this is the answer)... rodeoflip said "ramp up your training" and I was wondering what would be the most effective and appropriate way to do that to specifically prepare for back-to-back marathons. Harmander, a marathon every weekend is your bread and butter... what do you recommend I do to prepare for one reasonably fast (-ish... for a FV45) race and one "get round without destroying myself" run? Is it mainly increased volume/mileage?